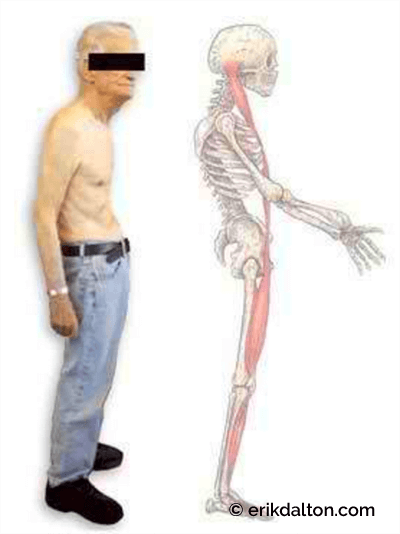 Hyperkyphosis and its resultant bent-over posture are often associated with older women (although men get them too). Since the word dowager is a technical term for a “dignified elderly woman” it began to be used to describe this condition. Because many older women developed the humped back people began to call it a dowager’s hump – even if the person with kyphosis was not an elderly woman. It’s not entirely clear what causes it — or if there is just one possible etiology. Most likely, there are many underlying causes making this a multifactorial problem. Length-strength imbalances, motor control issues, degenerative disc disease, ligament laxity, and certain metabolic problems top the list of potential causes. Since it seems to run in families, there could be a genetic link as well. Usually the person with hyperkyphosis isn’t as aware of the problem as others (family and friends) around them. Since it is more obvious when viewed from the side and most people view themselves in the mirror from the front, it can progress quite a bit before anyone seeks help for it. It can be completely asymptomatic, but neck, rib pain and breathing disorders can develop. 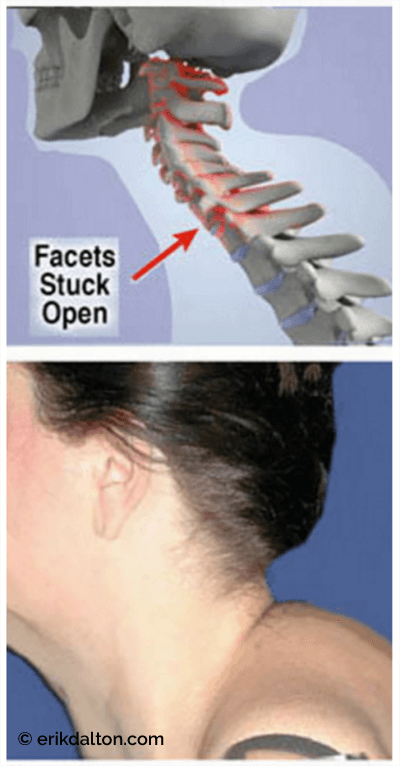 Even in moderate cases, it can become difficult to lie on the back comfortably because the head is flexed so far forward. 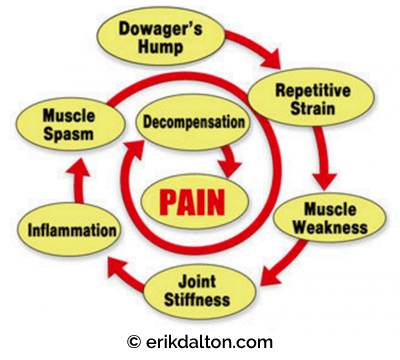 As we age, aberrant patterns become habitual, repetitive and narrow; pain-spasm-pain cycles develop; we have injuries; our posture worsens (Fig. 3). Joint and ligament proprioceptors designed to inform the brain as to where we are in space become lazy and develop amnesia. Thus, the conversation between body and brain becomes increasingly difficult and unreliable. Eventually our coordination, balance and movement may become very limited and that’s usually when clients seek our services. Doctors and scientists are starting to pay more attention to this problem. It’s not that it hasn’t been around for a long time, but with the growth of the Baby Boomer population, it’s beginning to raise a red flag of concern. The first line of defense is postural therapeutics, i.e., Myoskeletal Alignment Techniques, in conjunction with home-re-training rehab or referrals to competent functional movement specialists. One of the primary postural goals for today’s manual therapist is restoration and maintenance of proper vertebral curves. The contours of the vertebral column exist for a reason: to provide the least amount of strain to muscles, tendons, ligaments and joints so they can carry on with daily chores. If compromised in any way, the risk of future injury, protective muscle guarding, and development of pain/spasm/pain cycles seriously escalates.